Humfree guitar rig wiring and a lossless guitar sound without disturbing noise. 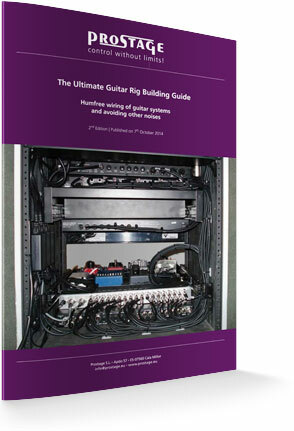 "The Ultimate Guitar Rig Building Guide" explains on over 30-pages how to build your dream guitar rig correctly. It is easy to understand and contains many illustrations. The guide focuses on the humfree wiring. In addition, it covers all other important points, which need to be considered for a high-quality, loss-less guitar sound without disturbing noises. The e-book consists of a theoretical and a practical part including trouble shooting. * The voucher will be emailed to you as soon as you have completed your order. The voucher does NEVER expire. Minimum order amount to use the voucher is 80 €. 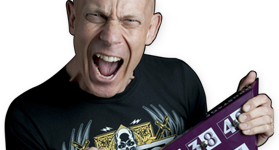 Yes, I want to get "The Ultimate Guitar Rig Building Guide"! Being a guitar player and not an electrical engineer, discovering The Ultimate Guitar Rig Building Guide by Lukas @ Prostage is by far the most comprehensive and accessible primer on building/using and diagnosing electrical rig maladies that even a layman can understand. The section 3 of the guide that illustrates the types of ground loops with specificity is absolutely top notch and extremely well written. This is illustrated very clearly and is an absolute boon to anyone suffering from ground loops. Though I do have a pedalboard, I am more of a rack user. Section 3.7 does an excellent job in showing how to avoid the pitfalls of pedalboard ground loops. This section also discusses the many ways rack mounted gear hum can occur and points to a checklist of sorts to help clear the occurrence of hum should it arise. The practical portion of the guide offers a logical and easy to understand suggested ordering of effects/gear in building a guitar rack. Though this type of gear has been available to guitarists for going on three decades now, I’ve never seen a guide which so clearly illustrates how to organize the gear and avoid the pitfalls of gear misplacement. All in all I think this guide is an absolute must for even the rig layman. The information enclosed is worth paying for.